What is the benefit to me as a practitioner? – you can increase your practice size. Who can sign up? 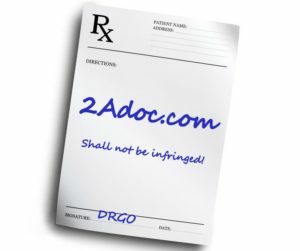 – ANY provider who respects second amendment and privacy rights can sign up, you just need to have decision making authority for the practice being added to our directory. Is this for physicians only? – No. This is for all healthcare providers: allopathic physicians, osteopathic physicians, dentists, chiropractors, psychotherapists, psychologists, counselors, optometrists, pharmacists, nurse practitioners, acupuncturists, etc. Does joining mean I can’t ask about guns? – A provider asking patients general questions about guns is an ethical boundary violation. Only in exceptional cases, where it’s clinically called for, should a healthcare provider inquire about guns. This does not prohibit casual discussion between two gun enthusiasts. How do I join? – Go to 2Adoc.com, fill out the sign-up form and you will get a confirmation email when you’re done. What is the cost? – No cost to you, it’s free to sign up. Will my info be public? – No, the directory will not be published. We will provide your contact information only to those who ask for providers in your field and your area.